The Kit 20 poles extend from 6’ 9" to 20 feet. The spring loaded plunger called the jack screws onto the end of the pole and adds a foot of reach. This product can actually be used in areas with a ceiling height up to 21 feet. The poles can be placed 8 to 10 feet apart. If there is any significant air movement that pushes the plastic you will need to pull them in closer together, anywhere from 4 to 8 feet. The GripDisk™ slide stoppers should always be used especially on hard surfaces. Two GripDisk™ slide stoppers come in every Kit 20 package. Please click here for more detailed info about the ZipWall, including a Video Tutorial. The Side Clamp is intended for use used the Foam Rail and works with SLP or Kit 20 poles to provide additional dust-tight containment along the wall without tape or staples. If you need a tight seal at the wall, consider the Side Pack (SDPK). It comes with 6 Side Clamps, six 3-foot foam rails, and a custom Carry Bag. 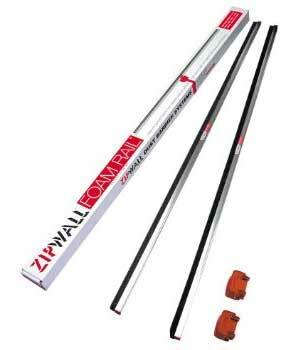 ZipWall® Foam Rail™ Accessories, provide a dust tight seal at the ceiling as well as the wall. Pop them on to the end of a 12 or 20 foot SLP pole, raise them into position and push the plastic barrier tightly against the ceiling. You can also use Foam Rails with Side Clamps to seal along the wall from floor to ceiling. Just overlap the ends slightly to create a continuous seal at the ceiling or along the walls. Start by squeezing the jaws of the Side Clamp until they open; then attach a Foam Rail, clamping the Foam Rail at the center. 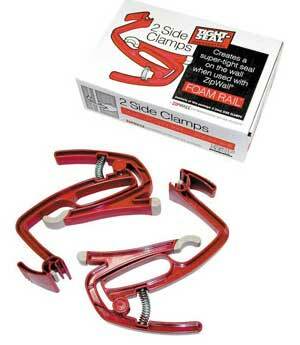 Each SC2 package contains 2 Side Clamps. Next, place the Side Clamp/Foam Rail assembly against the SPL or Kit 20 pole. Release your hand and the Side Clamp/Foam Rail assembly will press the plastic sheeting against the wall without the need of tape or staples. Several Side Clamp/Foam Rail assemblies can be overlapped to provide no-damage dust containment from floor to ceiling. When you need the barrier tightly sealed, or if your barrier is going to be in the same place for an extended period of time, Side Clamp/Foam Rail assemblies are the way to go. When working smooth flooring like vinyl or wood, or if there is a lot of air flow at the worksite, the Grip Disks keep SLP or Kit 20 poles in place. 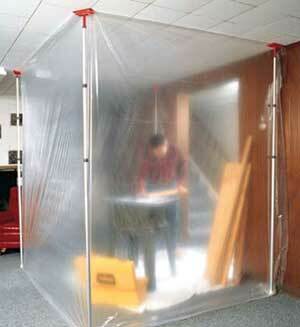 Slip one between the floor and the plastic sheet, then lower the pole onto the sheeting and pull the barrier tight. Each GD2 package contains 2 Grip Disks. 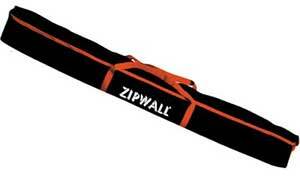 ZipWall is a registered trademark of ZipWall LLC. Once you see the value of ZipWall Dust Barrier Systems, it’s a sure bet that you will buy more ZipWall products over time. The ZipWall Carry Bag is a great way to keep everything organized and easy to transport. 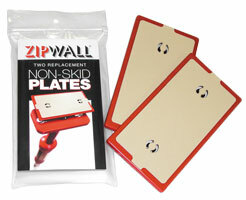 ZipWall® Carry Bag is the convenient way to store and transport yout Zipwall dust barrier system. It can hold up to 12 SLP poles. Foam Rails add an extra level of dust-containment by providing a seal along the entire ceiling. Used with SLP or Kit 20 poles, Foam Rails press the sheeting against the ceiling. No tape or staples are needed so there is no damage to repair. Each FR2 package contains two 5-foot Foam Rails and two T-clip adaptors. To use the Foam Rail, simply remove the head assembly from an SLP pole or the jack of a Kit 20 pole and snap on a T-clip adaptor. Then squeeze the T-clip to open it and insert the Foam Rail. Raise the Foam Rail to the ceiling. Repeat this with additional poles and until you have a continuous seal along the ceiling. Foam Rails are also ideal for use with dropped ceilings. Simply press them against the grid and follow it until the area is contained. 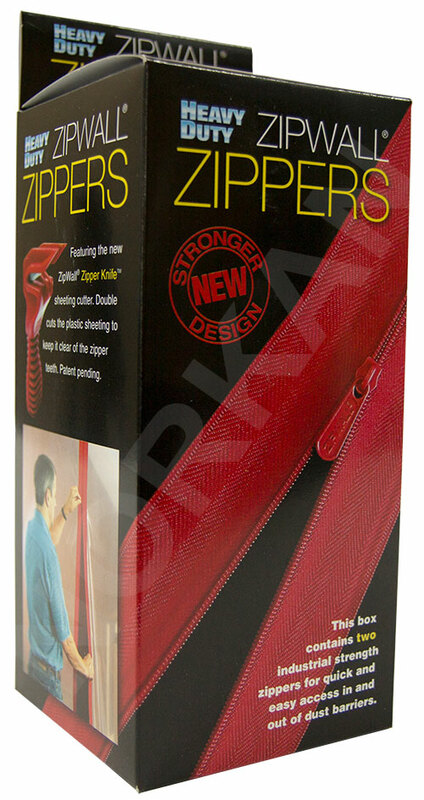 The ZipWall Standard Zipper provides easy access to the worksite. For personnel, use one zipper for a simple doorway or place 2 zippers side by side to create a wide roll-up doorway that makes it easy to move tools and building materials in and out of the worksite. 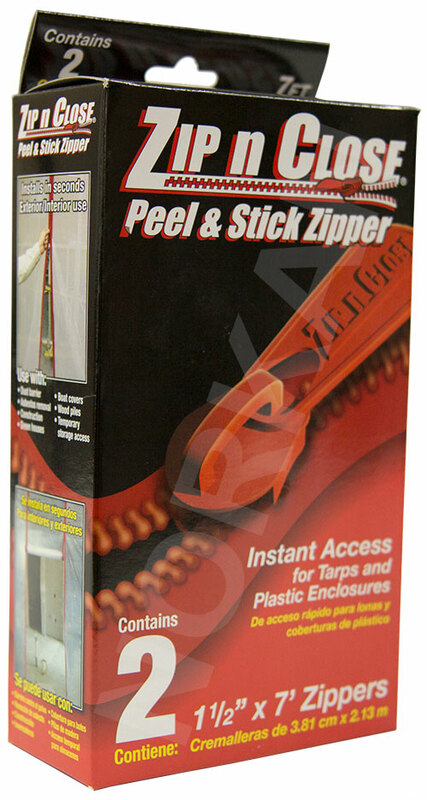 Each AZ2 package contains 2 self-adhesive Standard Zippers. The Standard Zipper is ideal for temporary interior barriers where temperatures don’t go below 55 degrees Fahrenheit. 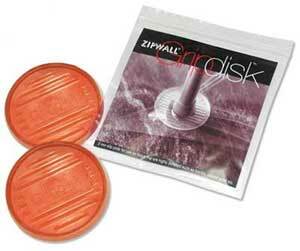 The ZipWall® Standard Zipper is designed for lighter duty jobsites. If the barrier is only in place for a short while or the temperatures stay above freezing, the Standard Zipper is the ideal choice. Create a simple entrance with a single zipper or a wide doorway by placing 2 zippers side by side. To install the Standard Zipper, unroll it and determine its placement. Be sure the pull is at the floor and that the end of the zipper is below where the plastic bends at the floor. Then, starting at the top, peel the backing off the zipper and press it firmly onto the sheeting. Next, open the zipper, making sure to keep the adhesive in contact with the plastic. With a razor knife, cut the opening using the teeth as a guide. Note: The Heavy Duty Zipper Knife will not work with the Standard Zipper. Now, with the zipper open, use your thumb and fore finger to press the plastic and the zipper together for a solid bond. Get your logo printed FREE on the canvas bag with a minimum order. Call for details. Logo printed in black. This unique system makes constructing temporary walls to control dust quick and simple! 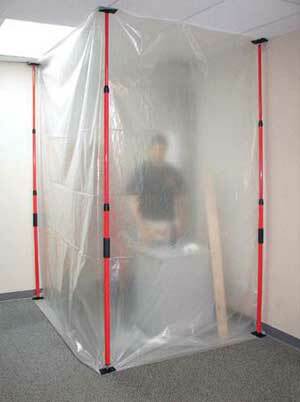 The DUST SHIELD Pole locks the screening material firmly against the ceiling. The Dust Shield poles can be extended up to 12 feet. Made of heavy guage aluminum. • Each kit contains 2 poles. • VISQUEEN poly sheeting sold separately. Installs in seconds with a pressure sensitive adhesive backing. Use a single zipper to form a flap or two zippers to create a wider opening. Can be operated from either side. Create an instant access to tarps or plastic enclosures. Reseals rooms to control dust and reduce heat loss. Perfect for all types of construction. For interior or exterior use. The new ZipHook™ is a handy accessory to help you keep things organized and off the floor. Just clamp one to a 12-foot or 20-foot SLP pole and you're ready to go. The ZipHook™ is a great way to keep tools, equipment and clothing off a dusty work site floor. Each ZipHook™ can support 40 lbs. Use the ZipHook™ to keep cables and hose off the floor as required by code when doing renovations in hospitals or medical facilities. 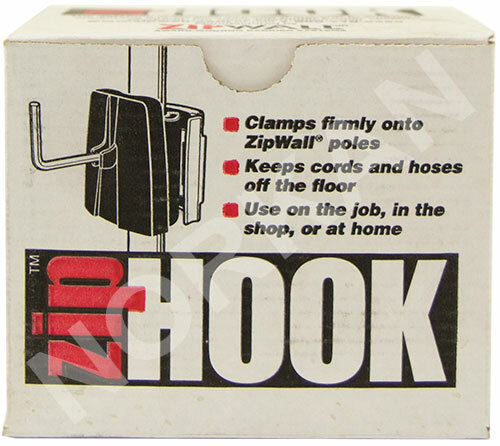 If you're an electrician, the ZipHook™ is a great labor savor when wiring for new construction. 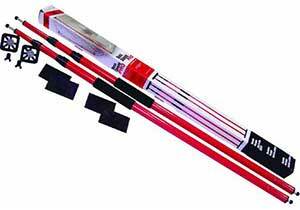 Mount them to SLP poles and use these to hold wiring in position while you tie it into a distribution panel. Tired of your bikes taking up valuable floor space? The ZipHook™ mounted to an SLP pole is a great vertical bike rack. Hang 2 bikes per pole and take back lost floor space. Since this bike rack portable, you can move this bike rack to where ever you need it, or take it with you to keep your bikes safe when you're on a vacation.